Home/Ruminations/Could Nevada’s New Law Be A Front For A New Mobile Advertising Format? Could Nevada’s New Law Be A Front For A New Mobile Advertising Format? Just last week, Nevada finalized making robotic cars legal with special licenses. The fact that such a thing would be done is cool enough in itself since we’ve been fantasizing about cars that take us where we want and would actually rather that we not pay attention. I, for one, would feel a whole lot safer having humans taken out of the equation in this age of texting and short attention spans. The video that is on NPR’s site is quite cool in conveying what goes into the mechanics better than most videos I have seen out there. While the whole piece focuses mostly on the legalities the Nevada DMV has provided, could the true gain for Google be that Nevada is actually helping them create yet another advertising platform? Looking at the fact that Google has already logged over 200,000 miles of robotic driving in California with no legal standing to do so and the fact that these cars are a number of years away from hitting the markets, the new Nevada license plates are effectively just another step in the elevating excitement about the possibilities. With other States in line to enact laws and license allowing robotic cars, those too will keep the buzz going and storylines prevalent until the car is complete and in the market – then we get to see what it’s really all about. I have certainly been dreaming about cars that drive themselves since seeing them in saturday morning kids shows in the 70s. It has always been about the joy of just keying in where I want to go and then getting there as if I had my very own chauffeur. Seeing now that Google is far along in development, it got me thinking about what the possibilities are – based on the fact that a company so steeped in advertising is leading the charge in developing these cars. We are already seeing the continued seepage of computers and applications into our car interfaces. With those, the opportunities to skip radio advertising altogether or interact with advertising in a different altogether has become the norm. I’m sure there would be more advertising delivered to us through our car applications if the government was not so worried about our paying attention to the road… If we no longer had to pay attention to the road, can you imagine what the ramifications would be? As quickly as we could key in our destination, the car’s computer could load up all of the route-relevant advertising. Rather than making a last second decision to swerve across two lanes to go into a parking lot because you just thought of buying something there, “drivers” could be warned a couple of minutes ahead that there might be something of interest they want to stop at. Users could even set it to always know where the closest clean bathroom is – just in case their newly-potty-trained child suddenly has to go. With hands free, “drivers” would have noting to do, so of course they will be demanding advertising to be shown on screens throughout the vehicle (since they can now look anywhere.) 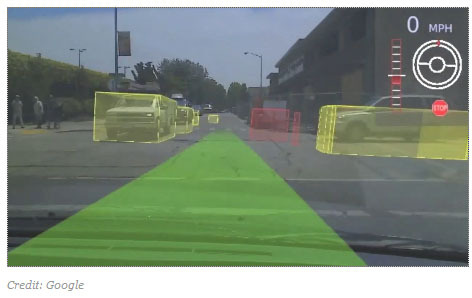 Perhaps creating the new technology of cars driving themselves is really more about the software than the hardware? Perhaps its Google’s version of my kid’s Leap Pad that requires you to only buy products from them at inflated prices. If Google created the media platform – a truly new mobile platform – and demanded that all advertising go through them, wouldn’t that create a form of financial euphoria for them? Actually, I hope the above paragraph is not the case. The closest I have come to that experience is sitting in a cab in New York or Las Vegas and seeing those annoying videos and I don’t care to have that same experience in my own car – even if it is driving me. But, there’s something to be said for being smart about smart advertising. Nevada and all other states that create special licensing for robots are absolutely not complicit in creating a new media platform. But, Google’s play in this is an interesting look into the future – beyond just a car that drives itself. I don’t know when it will come, but I still look forward to getting in my car and playing with all the available gadgets as I get from point A to point B. I just hope its not solely about Google creating a truly mobile advertising platform.